Can you switch bank accounts even if you have an overdraft? Switching bank accounts is something that we’ve spoken about a few times recently on Money Bulldog. We’ve mentioned the potential benefits of switching as well as touching on the new 7 working day switching process. What is the situation for those people who have an overdraft and regularly use it though? Can they still switch their current account? Recent research suggests that those people who tend to ‘live in’ their overdraft wrongly assume that the privilege of switching current accounts is not available to them, but this is not necessarily the case. Many banks are more than happy to take a new account holder on, even with an overdraft facility. In fact, many banks encourage current account customers to switch to them by offering to match a customer’s current overdraft facility when they switch. If you think about it, why wouldn’t they with the potential of earning interest on these overdraft facilities. While nobody is guaranteed to be able to switch accounts to a new bank – as a variety of things might cause a hiccup in the process – most people will experience no issues at all and this includes customers who hold an existing overdraft facility. So, if you do want to switch accounts then it is certainly worth taking the time to make an application once you have found an account that works for you. If you have already tried to switch current accounts and have had an application declined by one bank, and the reason they have given is that it is related to your overdraft facility, this also doesn’t necessarily mean that all banks will give you the same answer. So don’t be too dismayed and don’t let one unsuccessful application put you off the idea of switching if you genuinely feel that there are benefits to be gained from doing so. What should you look for in your new current account? One final thing to consider here is the need to look at a current account which offers favourable terms to people who regularly use their overdraft facility, especially if you use yours on a regular basis. Some banks will have a set fee for using your pre-agreed overdraft arrangement, even if you only dip into it for one day. They may then also charge further interest on the borrowed amount. Others may only charge interest on the amount with no set daily fee, whilst others may only start charging interest if you borrow over a certain amount. With this in mind then, we can see how important it is to check the terms and conditions of use to ensure that you choose an account which is going to be the friendliest account to your wallet. In conclusion then, don’t just assume that you will be locked out of switching current accounts just because you have – and use – an overdraft facility, as this is simply not the case. Many banks are happy to take on customers who have existing overdrafts in place and some even go as far as to market this fact in order to attract new custom. 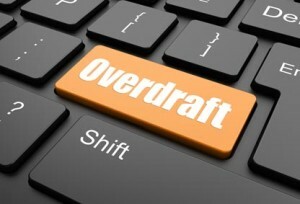 Have you switched your current account even though you had an overdraft? Or have you ever had a switch declined with your overdraft cited as being the reason? Do You Have Savings Accounts for ALL of Your Children?